American Roulette came on the scene long after European Roulette had already been established. European Roulette consists of a large 2-color wheel containing the numbers 0 to 36. A ball is dropped and the wheel is spun. Players can bet on the numbers or colors they think the ball will ultimately rest on. The game is easy to play and requires no special skills and yet it’s not one that you can easily beat. So it’s a bit odd that there would have been a need to create a different version of the game. However that is exactly what happened with the introduction of American Roulette. Before we take a look at American Roulette, and how it differs from its European counterpart, let’s start by taking a closer look at European Roulette. The wheel that is used for European Roulette was actually developed first in France. For this reason, it is sometimes referred to as the French wheel. 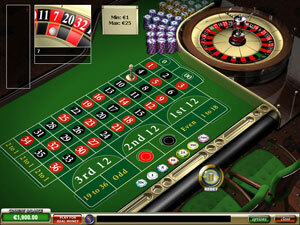 European Roulette became extremely popular among European players. Before long, news of this entertaining game spread overseas. The European Roulette wheel contains slots numbered from 1 to 36 and has an additional slot for a 0. The layout of these numbers is completely random and has no symmetry. American casino operators did not care for the odds of this particular game as they didn’t favor the house over the player. So, in order to increase their earnings with this game, they created the American Roulette wheel, which contains significant differences from the original European model. What Makes American Roulette Different From European Roulette? American Roulette includes some big changes from the European version of the game. American Roulette wheels contain 38 slots. Aside from the 0, there is an additional spot for 00. This is why American Roulette is sometimes referred to as “Double Zero” Roulette and European Roulette can be referred to as “Single Zero” Roulette. By incorporating this additional slot, the odds no longer favor the player. The casinos now have the edge. The layout of the American Roulette wheel is also different from that of a European wheel. American Roulette wheels have an established pattern whereby the numbers are placed in pairs directly across from one another. This is a more appealing design which was meant to cater to American gamblers. Players soon realized, however, that they weren’t experiencing the same level of good fortune when playing American Roulette. Players did not realize just how big a difference one additional slot could make when it comes to the odds. But the reality is that the odds on a single bet of American Roulette is 5.25% as opposed to the 2.7% edge a European wheel gives to the casino. Both versions of this widely popular game offer great entertainment value. But it is important to understand that these two games might sound the same, however there are major differences between the two. These differences can greatly impact your chances of financial success. So, the moral of this story is that when you want better odds at the roulette table, always stick with American Roulette!